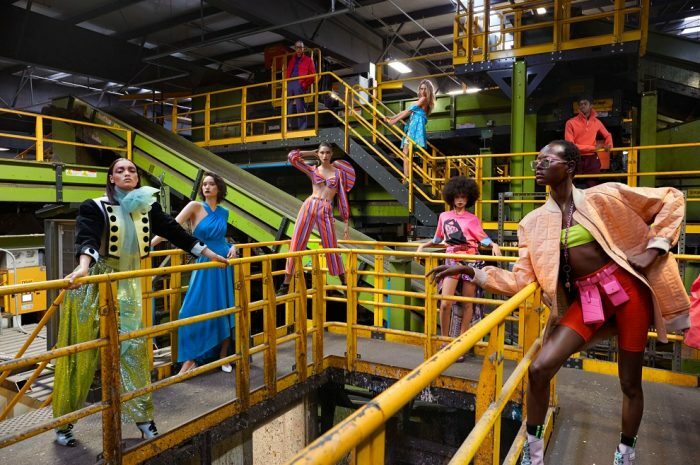 New York City—A mammoth recycling facility serves as the improbable backdrop for a fashion film featuring some of New York’s top models in Heatwave¸ a new short film directed by Grant Greenberg and produced by Derby for V Magazine and eyewear maker Oliver Peoples. Celebrated runway models Elsa Hosk and Hannah Ferguson, rising fashion star Alton Mason and others sport the latest spring fashions while posing amongst the tons of glass, plastic, aluminum and paper being sorted at New York’s Sims Municipal Recycling Center in Sunset Park, Brooklyn. The purpose of the piece is to celebrate new Spring fashion from top designers while encouraging Americans to recycle.